We need invest more in our people, to give our people confidence in themselves and hope for the future. We need to reclaim our right as masters of our own land, and not supporting actors in a movie with a bad script. Fellow Singaporeans, and voters of East Coast GRC and Fengshan SMC, good evening! My name is Gerald Giam and I am here to ask for your mandate to serve you in East Coast GRC and in Parliament. Please allow me now to say a few words in our national language. Although I am a Peranakan like my colleague Cheryl Loh, I am still trying to learn Malay. So please bear with me as I try. Saudara-saudari sekalian dan penduduk-penduduk GRC East Coast, salam sejahtera! Pada Pilihanraya yang lalu, sokongan anda membolehkan saya masuk ke dalam Parlimen sebagai Anggota Parlimen tanpa Kawasan Undi. Saya amat berterima kasih ke atas sokongan anda. Di Parlimen, saya telah berkerja keras untuk mempertengahkan isu-isu yang orang Singapura menghadapi. Sekali lagi, saya meminta sokongan anda untuk melantik saya sebagai Anggota Parlimen anda. Unidilah Parti Pekerja. Memperkasakan masa depan anda! Terima kasih. I will now continue in English. When I was growing up, I remembered a Singapore that was full of enthusiasm, hope and pride in our nation. We sang “Stand up for Singapore” and “We are Singapore” with gusto. When we travelled abroad, we would proudly tell our foreign friends about the progress we had made as a nation. In the decades following Independence, the government gave out many special tax breaks to MNCs, with the expectation that these companies would invest in local talent, transfer knowledge and skills to them, and eventually promote Singaporeans to head their local offices. Something started changing around the turn of the century. There was a creeping cynicism that had entered our national consciousness. The PAP was no longer that benevolent and all-capable government that many of us imagined it to be. We started to see a government that was starting to lose confidence in its own people. The PAP felt that Singaporeans did not possess sufficient talent to grow the economy at a fast enough pace. Economic growth is of paramount importance to the PAP because that is how it derives its legitimacy at elections, so they were under pressure to do whatever it took to feed this growth. This led to the fateful decision around that time to open the floodgates of our job market to foreigners. Before I go further, I would like to emphasise again that the Workers’ Party is not anti-foreigner. Most foreigners come here to work hard and build a better life for themselves and their families. Any criticism I make is against the PAP’s population policy, not foreigners themselves. So in the decade after the turn of the century, workers of all nationalities were brought in in large numbers to boost the economy. Knowledge transfer to locals ended up taking a back seat. Why spend money to train locals to do the job if you could easily hire a foreigner with low enough salary expectations? Meanwhile Singaporeans were told that foreigners would create jobs for Singaporeans; that the fruits of economic growth will trickle down to the poor. But this did not seem to be happening. Incomes could not keep up with the rising cost of living. Singaporeans started realising they were being squeezed out of jobs, university places and even choice primary school places. When you walk into any MNC now, many of the positions that were once occupied by locals are now staffed by foreigners. Even some GLCs and local banks are not spared. When Singaporeans complained, they were told that they were losing out because they had become less hard-driving and hard-striving. It took the big shock of GE 2011 for the government to finally wake up and realise that these were real problems that were hurting Singaporeans. Hence came the big “sorry”. Four days before Polling Day, the PM apologised to voters for “not getting it right”. Four-and-a-half years on, do you believe the PAP was really sorry? If you look at subsequent statements from PAP ministers after the election, they don’t admit that their population policy was wrong. Instead, they justify it as being right for that time. Some are even saying that demographic changes have been the reason for the foreign worker policy U-turns. Did we just turn into an ageing society four years ago? We need to make sure the PAP follows through with their “sorry” and fixes the mess they have created, which is an over-populated island without sufficient infrastructure to accommodate it. We need to invest more in our people, to give our people confidence in themselves and hope for the future. We need to reclaim our right as masters of our own land, and not supporting actors in a movie with a bad script. I have faith in our people. We have gone through so much together in the past 10 years as a nation. We will emerge stronger. We need a new style of leadership and approach to governance. This change will not come about if we leave the PAP to its own devices. We have to force the change on them. To do that, we ask you to send a strong message to them by voting in MPs who can hold the PAP to its “sorry”. Voters of East Coast GRC, I first contested here in GE 2011 as a young 33-year old. You gave our team then the second best GRC results in that election for an opposition party. My team and I have drawn strength from your support, as we have gone about meeting you in your homes or in markets, almost every week for over two years now. I am very grateful for your support. This is why I have given it my all in the last four years in Parliament, asking many questions, raising up issues that affect your lives, and proposing solutions to the challenges we face as a nation. Now I am contesting East Coast GRC again, asking for your mandate to become your representative and your voice in Parliament. Please support us, because there is a lot more work we need to do to empower your future. I would like to introduce my East Coast GRC team, who will be your voice in Parliament. I feel very honoured to be contesting with this team of very capable and committed men. First, is Mohamed Fairoz bin Shariff. Fairoz holds an honours degree in history and a master’s degree in Southeast Asian Studies, both from NUS. He has been a lecturer at SIM University and was with the National Library Board until a few weeks ago, when he had to resign to contest the elections. Fairoz is a dedicated husband and father. He is a man of strong conviction and principles. If elected, I have no doubt that he will not only care deeply for his residents, but will also be able to raise very important issues in Parliament that affect all Singaporeans, including the Malay-Muslim community. Next, Associate Professor Daniel Goh Pei Siong. Daniel needs little introduction. He is one of the foremost sociologists in Singapore. He is the deputy head of the Department of Sociology at NUS and has a PhD from the University of Michigan. Daniel has a tremendous ability to analyse policies, crunch the numbers that support policy proposals and present them in a way that everyone understands. You can be sure that he will be able to effectively debate issues with Ministers in Parliament. And last but not least, Leon Perera. Leon obtained a double first class honours degree in philosophy, politics and economics from Oxford University. He was a PSC Overseas Merit scholar and later co-founded an international research consultancy. He is now the CEO of his company, which operates in 8 countries. Despite all his achievements, Leon is one of the most humble persons I know. He has also been involved in both policy and grassroots work in the Workers’ Party for the last few years. His corporate management experience will be a great asset in running a Town Council together. Residents of East Coast GRC, we are here to serve to you! Please vote for us so that we can serve you as your town councillors and MPs in Parliament. Vote for the Workers’ Party! Empower your Future! The problem, it seems, is not just that maintenance of the MRT lines was lacking, but that SMRT and the government, which owns the rail assets, did not adequately plan for the renewal and replacement of ageing rail assets before their end-of-life. Is this what is called forward thinking and anticipating problems before they occur? Residents of Nee Soon GRC, good evening! My name is Gerald Giam and I am the Workers’ Party candidate for East Coast GRC. During the first rally, I shared with you why it is important to elect in a sizeable number of credible opposition MPs into Parliament. This is so that we can better scrutinise government policies and build up a credible alternative to insure Singapore against a decline in the ruling party. But what is a “sizeable number”? From 1981 to 1991, we had only one or two opposition MPs. Was that enough? From 1991 to 1997, we had four opposition MPs, but it fell back to two in 1998. Was that enough? In the last Parliament, we had seven elected opposition MPs. Do you think that was enough? Let me share with you some numbers to give you a sense of how many opposition MPs are needed to properly empower you, the people. To pass a law in Parliament, at least 45 MPs are needed, or more than half the total MPs present. To prevent the Government from changing the Constitution and introducing things like the GRC system, we need at least 30 elected MPs. To have an opposition MP shadow each Ministry, we need 16 MPs. But this is not even enough to shadow all the ministers, ministers of state and parliamentary secretaries currently in the government. So, my friends, seven is certainly not enough. We need many more opposition MPs in Parliament to form a proper check on the power of the PAP. Come September 11th, we ask for you to vote all 28 Workers’ Party candidates into Parliament. Having seven, 16 or 28 Workers’ Party MPs in Parliament will not cause gridlock, because we are a party that puts the country’s interests first and foremost. We will debate policy issues rationally and responsibly, and will not resort to personal attacks. Tonight, I want to continue sharing with you more policy proposals from the Workers’ Party that will better the lives of Singaporeans, including ordinary citizens like you and me. The PAP has responded to our proposal for the introduction of a national minimum wage. I am glad that we have gotten this important conversation going. It is an issue that affects the lives of well over 110,000 full-time workers who get earn less than $1,000 a month. The PAP’s counter-arguments revolve around the following: One, it will cause job losses. Two, we already have Workfare. And three, we have the Progressive Wage Model. Let me address all three in turn. First, on job losses. There have been many studies that have shown that minimum wages set at modest levels do not lead to job losses. A “modest” level means less than 50% of median full-time income. In Singapore, this will be $1,885 . The minimum wage we are proposing is about $1,000 a month. This is only 27% of the median income – well within the “modest” range. So there should be no fear of job losses. Furthermore, this would be an ideal time to introduce a minimum wage, because we are reducing the inflow of foreign labour, so there are more jobs than there are people to fill them. Raising wages will attract more Singaporeans into the workforce to fill these positions. It could also improve productivity and reduce turnover, as workers are more motivated in their jobs and are less likely to switch jobs. It is therefore “win-win” for workers, employers and the economy. Second, on Workfare, which is a wage supplement for low wage workers. The Workers’ Party supports Workfare. We are not proposing that the minimum wage replaces Workfare, but complements it. A minimum wage together with Workfare will ensure that both employers and the government do their part to uplift the incomes of our low wage workers. A worker on the minimum wage should still continue receiving Workfare, although the Workers’ Party proposes that we double the cash proportion of Workfare so that workers have more disposable income to spend on their daily needs. Third, on the Progressive Wage Model or PWM. I debated this in Parliament last year and won’t go into the details. The PWM is essentially a minimum wage for specific industry sectors. Its introduction is an admission by the PAP government that we cannot wait indefinitely for wages at the bottom to increase naturally. However, the PWM will be implemented in only three industry sectors, covering 70-80,000 workers. That still leaves over 30,000 workers who will continue earning less than $1,000 a month. A national minimum wage will ensure that all Singapore workers will earn a decent living wage to meet their needs. I would now like to turn to another issue that affects many Singaporeans: public transport and in particular, MRT breakdowns. Like many of you, I don’t own a car and I usually take public transport. I got caught in both the massive MRT breakdown in December 2011 and the even bigger one in July this year, and many other delays in between. I’m sure many of you will understand that frustrating feeling of having to get out of a stalled train, taking a long route to your destination and being late for work. I asked the Transport Minister in Parliament whether there was a delay in the replacement of the ageing parts of the MRT system that could be the cause of the frequent breakdowns we have been experiencing the last few years. I discovered some surprising things along the way. I found out that a key component of the MRT tracks called the ‘sleepers’ are designed to last 15 to 25 years. They have to be replaced when they are near the end of their lifespan, or when they show signs of significant wear and tear. Do you know when the sleepers on the North-South and East-West MRT line started to be replaced? In December 2012, more than 25 years after operations started, and it takes another 4 years to replace all the sleepers. The replacement programme for the ‘third rail’, which was the likely cause of the July incident, was also delayed until 2017. The signalling system too had a maximum lifespan of 15 years, but a contractor was not appointed to replace it until 2012 when it was 25 years old. The Workers’ Party calls for a not-for-profit and government-owned National Transport Corporation to own and manage all rail and bus assets. This will minimise costs and achieve efficiency in the management of these assets. A dedicated entity that manages rail and bus assets will better ensure that maintenance and renewal are done in a timely fashion, insulated from the profit pressures that public transport operators face. Fellow Singaporeans, these are just a few of the over 130 proposals that the Workers’ Party has put forward in our Manifesto. Our candidates will be sharing more of these proposals in this and subsequent rallies. In doing so, I hope that you can see that we are a party that brings to the table practical proposals that will improve your lives. Vote for the Workers’ Party, to empower your future! In this last Question Time in the 12th Parliament, I asked the Transport Minister what was the root cause of the massive MRT breakdown on 7 July 2015 and asked whether rail assets were renewed according to schedule. Mr Gerald Giam Yean Song asked the Minister for Transport (a) how an electrical insulation problem in one “third rail” cover between Tanjong Pagar and Raffles Place MRT stations can cause a catastrophic failure across the entire North-South and East-West Lines (NSEWL); (b) whether this is an indication of a lack of built-in redundancy or poor system design of the MRT’s electrical network; (c) whether engineers have assessed that a massive overhaul of the NSEWL is needed to prevent such failures from recurring; and (d) if so, what it will take in terms of time, cost and system downtime for such an overhaul to be completed. The Minister for Transport (Mr Lui Tuck Yew): Mdm Speaker, as explained at the LTA-SMRT joint briefing on 29 July 2015, the disruption on 7 July on the North-South and East-West Lines was caused by intermittent tripping of the power system at multiple locations. Chloride deposits, possibly exacerbated by a water leak in the tunnel, lowered the electrical resistance of a third rail insulator between Tanjong Pagar and Raffles Place stations. This allowed electricity to flow through the insulator to the ground and led to a higher than normal voltage difference between the running rail and the ground. Because the running rail is connected throughout the North-South and East-West Lines, the higher voltages would show up at multiple locations across the network. The movement of trains further elevated the voltages. When confronted with abnormal voltage, the 64P safety mechanism would be activated as a safety precaution. This safety mechanism is widely used in overseas systems such as Japan’s, as well as in all our rail lines. In this instance, the safety mechanism was activated to trip the power at multiple locations across the two lines. As to whether it was design or maintenance flaws that precipitated the incident, I would say that LTA’s investigation is ongoing and so it is perhaps premature to prejudge the conclusion. But, as a general rule, I would say that if there are design flaws, we are likely to see it pop up within three to five years or so of operating the line, rather than to see it come up 25 years or so after the start of operations. In the interim, SMRT is replacing all the third rail insulators. SMRT has also combed through the tunnels to ensure that there are no other leaks with water dripping onto trackside installations, and will be installing data loggers at all traction power substations within the next two months to better monitor the condition of the insulators. Lastly, we will be making the North-South and East-West Lines less susceptible to such power trips by increasing the touch voltage threshold for the 64P safety mechanism to levels similar to international standards, as well as the newer Circle and Downtown Lines. Mdm Speaker: Mr Gerald Giam. Mr Gerald Giam Yean Song (Non-Constituency Member): Thank you, Madam. I have four supplementary questions for the Minister. First, given that the North-South and East-West Lines started operations in 1987, when did its rail assets, specifically the sleepers, signalling system and third rail, reach their end of service life? Second, when did the renewal and replacement works for the sleepers, signalling system and third rail commence? Third, is it LTA or SMRT that is responsible for the renewal of these assets? In other words, who owns these assets? And who is supposed to initiate the process of renewal and who is supposed to bear the cost? And lastly, what was the cost of the renewal and replacement of these assets and how much of this cost has been borne by the Government so far? Mr Lui Tuck Yew: If you look at the sleepers, for instance, and you are talking about the wooden sleepers, there were two sets of wooden sleepers that were used. One set had deteriorated more quickly than the other, even though it was installed later. Therefore, it is a little bit hard to give you a definitive time frame as to how long these sleepers can last because it depends on their conditions, the type of wood, how it is treated and a variety of different factors. And therefore the more important thing is actually to monitor them on a consistent level, and replace them on an ad hoc basis as and when necessary. But when it reaches what is considered the critical threshold, then you want to consider changing them out, replacing them en masse, and in this case we are doing so by replacing them with concrete sleepers. For the third rail, the programme is ongoing and we will be able to replace the third rail in its entirety by 2017. There is a slight delay to the programme because there was a need to try and de-conflict all the works that are ongoing, like replacing the sleepers which we give priority to, the re-signalling which we also give added priority to, over the third rail. But this is ongoing now and its replacement will complete in 2017. On who is responsible for initiating the review, it is the operator’s responsibility because they are responsible for the maintenance, and so they will have the best idea of the condition of these different components. As to who bears the cost, there is a formulation, quite a complicated one in the original White Paper, which I do not intend to go into, but we had talked about this previously. Basically, the Government bears part of the cost of the replacement and renewal. But because we think that actually it could have lasted us longer if it was better maintained over the years; therefore you also take a discount from what the Government would otherwise have to pay. But formulas are all set up in the White Paper. I believe I have answered the Member’s questions. Mr Gerald Giam Yean Song: I thank the Minister for the reply. I did some research on the SMRT website, and according to the FAQ section, the timber sleepers are supposed to last between 15 and 25 years. Can the Minister verify that this is the case? Does the operator replace the sleepers only when it reaches its end of life, or does it replace when it sees signs of wear and tear? Because if we count 15 to 25 years from 1987, the sleeper replacement ought to have been completed by 2002 or 2012. But according to SMRT, the sleeper replacement only started in November 2012 – this is the press statement that they issued – and it will not be completed until 2016. So, why was there such a long delay and who is responsible for this delay? And did the delay in sleeper replacements pose any risk to commuters’ safety at any point? Regarding the signalling system, again according to the SMRT website, the replacement of the signalling system started only recently, and this is more than 28 years after the line operation started. My last question is: have there been any problems or conflicts between LTA and SMRT that resulted in delays in the renewals of these critical rail assets? And how has MOT stepped in to resolve these differences so that there is no delay in the renewal process? Mr Lui Tuck Yew: As I have said before on sleeper replacements, it is an on-going process. The sleepers do not deteriorate to the same extent, even though they may be within the same locality, and that is borne out by some of the pictures that I have seen over time. So, you may have one or two sleepers within the section that have deteriorated more significantly than any of the others. So, what we do is, on an on-going basis, we will replace them. But at a certain point in time, when the assessment is that in order to be at the top of the curve, you would want to replace them en masse and with a different set altogether, in this case, with concrete sleepers. Were there any risks to commuters? The answer is “no”. On the signalling system, actually, the signalling system is still working reasonably well. Part of the reason why we initiated the upgrading of the signalling system was because we wanted to be able to run the trains at shorter headways. The current signalling system allows trains to operate at 120 seconds. The newer systems, including that in the North East Line, for example, will allow you to run trains at tighter intervals. And we wanted to be able to do that in order to add capacity to the North-South and East-West Lines, and that was one of the primary reasons why the signalling upgrading project was initiated. On conflicts and delays between the operator and the regulator, as I have explained before, it is actually a fine balance. They have too cosy a relationship, you get worried; if they are at loggerheads all the time, you will get worried, too. So, we expect a certain healthy tension because one is operating it and one is regulating it, doing the audits, doing the checks, providing some of this feedback to urge the operator to take certain actions and to expedite what they are doing. What they do is that they report to me on a three-monthly basis. After the December 2011 incident, I felt that the way LTA was overseeing the operators needed some improvement. In the past, we were looking at the outcomes and the indicators that we get every so often. But by the time the indicators take a clear turn for the worse, it probably is a little bit too late. That was number one. Two is that because we were initiating a whole series of major projects, there was a need to make sure that there was proper coordination, both between the regulator and the operators, as well as within the operator itself. And I wanted to have more direct oversight of all these different arrangements. So, I initiated the joint teams, I required them to report to me every three months. What we have done more recently is to step up the audits by LTA on the operators, both planned and surprise audits, and also to embed a dedicated team from LTA in SMRT itself so that we can have a better insight of what is happening, on an almost day-to-day basis. Mr Gerald Giam Yean Song: Thank you, Madam. I appreciate the Minister’s point that because there are so many replacement works that need to be done, there is a need to prioritise them. Would the Minister agree that a lot of these replacement works should actually have been started earlier on, pre-2012, in order to be able to complete the replacement works in time before the end-of-life of the system? Mr Lui Tuck Yew: I think it is not always clear when the end-of-life is. There may be an estimate given but, because of varying conditions, that can always change. In any case, I suspect that perfect foresight is as rare as 20-20 hindsight is common. Ask yourself: Can you support a family in Singapore with less than $1,000 a month? Residents of Hougang and from all corners of Singapore, good evening! It is so wonderful to be back here to speak with you. During my house visits in East Coast GRC, a few residents have asked me what the opposition can do for them in Parliament. Some think, if we only have a few elected MPs, we can’t get laws changed or prevent bad laws from being passed. We can only make speeches and hope for the best. I believe that our value as an opposition party is not just about taking up more seats Parliament or making speeches. It is much more than that. First of all, if you elect a sizeable number of opposition candidates into Parliament, it will send a signal to the PAP that all is not right with their policies and their attitude towards the people. 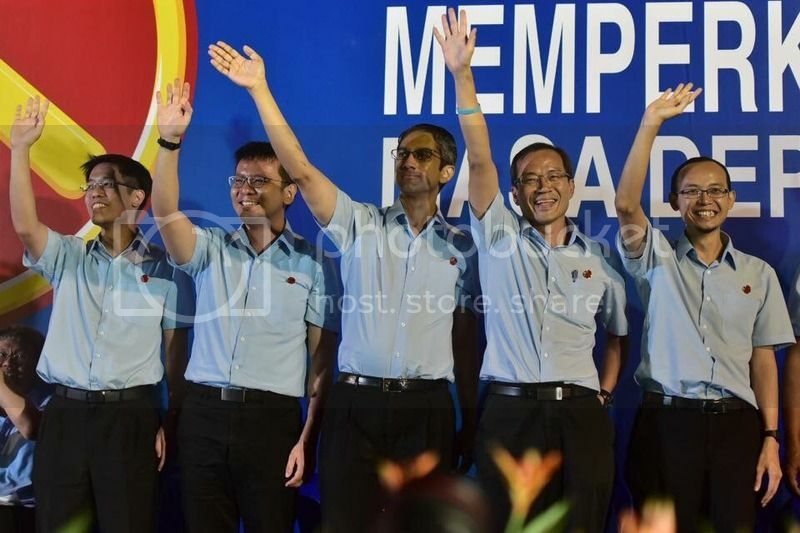 On the other hand, if you give the PAP an overwhelming vote, they will take it that you strongly support their policies on manpower, immigration, public transport and healthcare, and they can continue on the same path. Second, once we have a critical mass of capable MPs in Parliament, we would have more resources, time and manpower to scrutinise government policies more closely, propose better alternatives and put pressure on the government to implement these policies. We need enough MPs to be able to effectively examine the work of over 16 ministries, 66 statutory boards and many other government organisations. Third, by sending a good batch of Workers’ Party candidates into Parliament, you are helping to build a stronger and more credible alternative party that can form a bulwark against any incompetent government that may arise in the future. No governing party lasts forever. History around the world is filled with governing parties which started out well, but eventually lost the support of their people. The real political risk for Singapore is not an opposition that causes gridlock, but not having an alternative to the PAP if it fails the people. So what are the policy changes that we are pushing for in this election? I would like to invite you to read our Manifesto, entitled “Empower Your Future”. It is available for sale here at the rally or you can download it from our website for free. It is 46 pages long and contains over 130 proposals for improving the lives of Singaporeans. Today, I will talk about one major economic proposal in our manifesto: The introduction of a national minimum wage. What is a national minimum wage? A minimum wage is the lowest salary that employers are legally allowed to pay their workers. A national minimum wage will apply the same wage floor across the country, instead of having it only apply to certain industries. The minimum wage is not a new concept. The first minimum wage law was introduced in New Zealand in 1894 and now almost all countries in the developed world have minimum wages or some way of ensuring a wage floor. We are one of just a handful of countries that do not have a minimum wage. Why do we want to introduce a minimum wage? There are many reasons, and I will outline just a few today. First, we want to reduce poverty in our country. This is a basic responsibility of any government. There are about 110,000 full-time employed Singapore residents who earn less than $1,000 per month. This is based on 2011 figures provided to me after I asked the Manpower Minister a Parliamentary Question. This means that together with part-time employees, there could be well over 110,000 Singapore residents who earn less than $1,000 per month or the hourly equivalent of $5.25 per hour. According to the government’s Household Expenditure Survey, the average monthly household expenditure for the poorest 20% of households is $2,230. This means that even if both parents in a household are working but earning less than $1,000, it is still not enough to cover their expenses. According to another government statistic that I obtained in Parliament, a family of four on average spends $1,250 per month just to pay for basic needs. I think most of us would agree that in the world’s most expensive city, which is what Singapore is according to the Economist Intelligence Unit , it is not reasonable to expect a household to live on less than $1,000 a month. The second reason we are calling for a minimum wage is to encourage more people to join the workforce. There are currently many women and older persons who choose not to work because the wages they would earn are not able to cover costs like transport and childcare. So it is more worthwhile to stay at home and look after their children. This is an untapped labour pool in our economy, particularly at a time when we are faced with a labour crunch. If we can encourage more people to enter or re-enter the workforce, it could help to improve economic growth and at the same time reduce our dependence on foreign labour. Third, we have cannot afford to wait much longer for productivity to rise before raising the incomes of our lowest paid workers. The PAP government set a target of achieving 2 to 3% productivity growth per year up to 2020. But for the last 4 years since the last election, productivity growth has been close to zero or negative. In fact, a minimum wage could push employers to raise the productivity of low-skilled jobs. It could incentivise them to provide better training for their low-skilled workers and introduce automation, to help raise workers’ productivity to match the higher wage levels. There are other reasons for introducing a national minimum wage, and there are exceptions that are usually granted to reduce their negative impact on businesses. I do not have time to elaborate on them in my speech, but the Workers’ Party welcomes a national debate on this issue. We will be happy to address this issue in more detail during the course of this election campaign. The national minimum wage is just one of the many proposals that we will be pushing for in Parliament, if you elect us as your representatives. Our goal is not to oppose everything the government is doing, but to work with the government to identify better solutions and to put pressure on them to implement those solutions, for the benefit of all Singaporeans. Fellow Singaporeans, we stand at a critical moment in our history as a young nation. We are no longer a developing country that is struggling for survival. We have achieved enviable level of economic development and peace, due to the hard work of our pioneer generation and many others that followed, and our commitment to work together despite our differences. Yet there are segments of our population that have not reaped the full benefits of our economic growth. We need to do more to uplift the lives of these fellow citizens, and so create a more equitable society and dynamic economy. 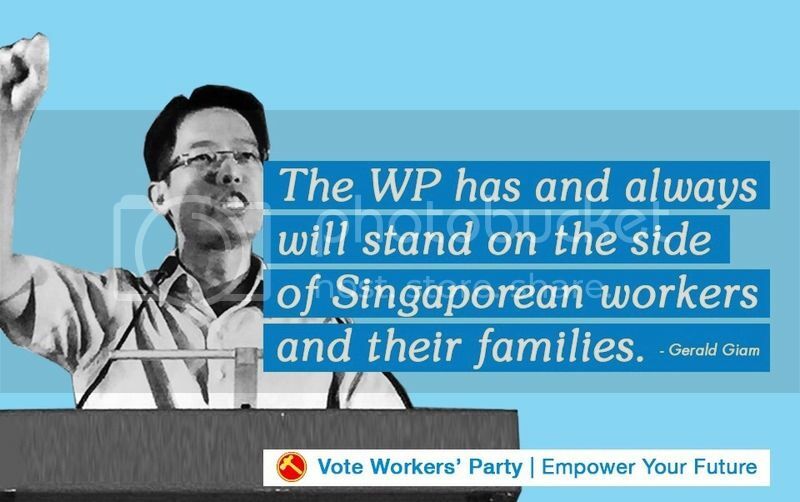 The Workers’ Party has and will always stand on the side of Singaporean workers and their families. Please support us in this election, so that we can continue to push for more compassionate and sound economic and social policies. Vote, for the Workers’ Party. Vote, to empower your future! The bus contracting model is now in its second year of implementation. Only two contracts have been awarded so far. It is too early to gauge whether this model will indeed drive greater cost efficiency and service quality for commuters, while keeping fares affordable. All stakeholders, including the government, should monitor this model closely over the next few years to assess its results. If it turns out that cost efficiency and service quality have not improved as a result of this model, the government should be prepared to explore different models, including having a government-owned National Transport Corporation take over the running of public bus services on a not-for-profit and cost-recovery basis, to ensure that service quality for commuters is not compromised. The Bus Services Industry Bill seeks to regulate the provision of bus services, and the operation of bus depots and bus interchanges in Singapore. It also gives effect to the recently-introduced bus contracting model via a bus services procurement framework. The Workers’ Party welcomes the government’s shift towards taking over the ownership of bus assets, the planning of bus routes and the setting of fares, while contracting out bus operations to the private sector. This will hopefully give the government greater control over the service quality and affordability of public transport, which is an essential public service. I have a few queries on this Bill and the bus contracting model in general, which I hope the Minister can address. First, on the maintenance and renewal of bus assets. Under this Bill, bus operators will be responsible for the maintenance of bus assets, which will be owned by the government but leased to operators. LTA’s lack of direct involvement in bus operations could result in information asymmetry between the regulator and the operators. Essentially, LTA may not have a full understanding of what is going on under the hood of bus operators, and hence may not be able to take the necessary regulatory or enforcement action should maintenance be lacking. How will LTA ensure that bus operators conduct proper maintenance of these buses? How will LTA mitigate the risk that the buses may be poorly maintained or abused because the operators do not own them, resulting in shorter lifespan or more frequent breakdowns? Which entity will be responsible for the renewal and replacement of essential operating assets when they approach their end of serviceable life? The broader question on this issue is: How will the Ministry of Transport manage any possible conflicts between LTA and the operators, to ensure that there is proper accountability, so that disagreements between the two entities do not result in delays or failure to conduct proper maintenance and renewal of essential operating assets? Next, on buses and crisis response. Currently, most public bus operators are also MRT train operators, and they can reallocate resources internally to respond to incidents like MRT breakdowns. This is likely to change in the future, with the bus routes eventually tendered out to different operators. How will LTA marshal bus resources from different operators to respond to crises like the massive MRT disruption we saw last July? Is there any provision in the bus operator contracts that state that operators must make their bus resources available to the government to respond to crises? Third, I would like to ask about the transition between bus operators. The bus contracting model is likely to see more frequent transitions between bus operators. How will LTA ensure that the incumbents maintain high service levels as they transition out of areas where they will no longer be providing bus services? I am particularly concerned about manpower transitions that may affect service levels for the commuter. Fourth, on the removal of the CEO of bus operators. Clause 19 requires bus operators holding a Class 1 bus service licence to obtain LTA’s approval before appointing, re-appointing or removing its CEO or board chairman, failing which LTA can issue a direction to reverse that decision. However, if a current CEO of a public bus operator is incompetent or unable to provide effective leadership to ensure the smooth operation of the bus services under their contracts, does LTA have any power to remove that CEO before the expiry of his or her contract? Madam, the bus contracting model is now in its second year of implementation. Only two contracts have been awarded so far. It is too early to gauge whether this model will indeed drive greater cost efficiency and service quality for commuters, while keeping fares affordable. All stakeholders, including the government, should monitor this model closely over the next few years to assess its results. If it turns out that cost efficiency and service quality have not improved as a result of this model, the government should be prepared to explore different models, including having a government-owned National Transport Corporation take over the running of public bus services on a not-for-profit and cost-recovery basis, to ensure that service quality for commuters is not compromised. Finally, Madam, I would like to record my thanks to Minister for patiently answering all my PQs (Parliamentary Questions) and responding to my speeches on transport over the last 4 years, and I wish him all the best in his future endeavours. Madam, I support the Bill. I will be asking Ministers the following questions in Parliament today (13 July 2015). *7. To ask the Minister for Manpower (a) what accounts for the drastic fall in job growth from 28,300 jobs in Q1 2014 and 40,700 jobs in Q4 2014 to just 300 jobs in Q1 2015; (b) whether this trend has continued into Q2 2015; and (c) what implications does this have on Singapore’s economy. *40. To ask the Minister for Trade and Industry (a) whether the Government can provide a Gini coefficient trend line on income distribution for the past five years that includes the foreign population living and working in Singapore; and (b) how this Gini coefficient compares with other major cities like New York, London and Hong Kong which incorporate these segments of their populations in their Gini calculations. *76. To ask the Minister for National Development (a) whether the Government is concerned about the recent record price of $31 million paid for a coffee shop in Bukit Batok which follows the $23.8 million transaction in 2013 for a coffee shop in Hougang; and (b) what measures is the Government taking (i) to mitigate the downstream impact of such high transactions on stall rentals and the price of cooked food in those coffee shops; and (ii) to prevent property speculation in coffee shops which many lower income residents depend on for affordable food. 23. To ask the Minister for Foreign Affairs (a) what is the Government’s foreign policy on the Rohingya situation in Myanmar which is causing a refugee crisis in Southeast Asia; and (b) whether the Government has raised any concerns on the situation with senior members of the Myanmar Government and Opposition and, if so, what are their responses. 27. To ask the Minister for Transport whether the Government will consider reducing the contribution rate of de-registered Category D (motorcycles) COEs to Category E (open) from the current 10% to 0% in order to return more COEs from de-registered motorcycles to Category D and mitigate the price of quota premiums for motorcycle owners, many of whom are from lower income groups and need their motorcycles for work. The numbers next to the questions denote the order in which the questions will be answered (for questions for Oral answer). The above questions do not include questions on the MRT breakdown on 7 July as this disruption took place after the deadline for filing PQs. The Workers’ Party is deeply worried over the 3.5 hour disruption of train services along the entire stretch of both the North-South and East-West MRT lines on 7 July 2015. The severe inconvenience caused to an estimated quarter-of-a-million commuters during the evening rush hour makes this the most serious MRT disruption in Singapore’s history. The latest breakdown comes on the heels of repeated assurances by both SMRT and the authorities about the improved reliability of our transport system. Yet, the number of significant train delays reached an all-time high of 12 in 2014 and stands at 8 in 2015. This is despite billions of dollars of government funds being pumped into improving the existing MRT infrastructure since 2011. Even as the LTA and SMRT work together with their engineers and external consultants to identify the precise cause of the breakdown, we find it particularly troubling that two of our country’s main rail lines can be fully disrupted by what appears to be an electrical fault. This raises questions about our transport system’s resilience, particularly as such a system-wide failure could have repercussions on our nation’s economic and national security interests. We call on the authorities to enforce a more rigorous maintenance regime on the rail network, with effective measures in place to ensure that commuters’ interests take precedence over corporate profits. For key performance indicators (KPIs) such as the number of unscheduled train withdrawals per 100,000 train kilometres and the number of service delays exceeding 30 minutes, concrete targets must be set and disclosed to the public. In the meantime, engineering and front-line staff should also be provided with proper support by their employers to ensure that they are equipped to handle any similarly challenging situations in the future. Their efforts and tireless work – many working through the night – should be recognised, and we would like to express our appreciation for their hard work. The original statement can be found HERE. The Commission of Inquiry (COI) into the November 2011 MRT disruptions had identified maintenance (or lack thereof) as a key cause of the multiple breakdowns then. Now, almost 4 years later, with a new CEO at the helm who promised to focus more on engineering and maintenance capabilities, we seem to be back to square one. What can we expect moving forward? Another COI? I was caught in the massive breakdown of the North-South and East-West Line (NSEWL) of the MRT yesterday evening as I was heading to a meeting at the WP HQ in Jalan Besar. When I reached Dover station at about 7.05pm, the eastbound train was already at the platform but with all its cabin lights off. I got onto the train anyway, but waited almost 5 minutes before it finally moved off. The westbound train on the opposite track was similarly stalled. My train stopped midway to the next station and all its lights went out again. This pattern was to repeat itself several more times over the next 25 minutes. When I reached Outram Park station at about 7.35pm, the lights in the train went out a final time and we were told to detrain as it was no longer in service. The PA system announcements at the station informed us that train service on the entire NSEWL had been suspended and free shuttle buses were available. So I exited the station thinking I could hop onto one of the buses. Big mistake! The street level was packed with people and there were no buses to be seen and no directional signs to guide the stranded commuters. Someone asked me where the buses were. I told him honestly that I had no idea. Knowing that it would be pointless to attempt taking a cab, I headed back down to the station, against the flow of the crowd, hoping to get in again and take the North-East Line (NEL). But all the fare gates were closed and I was told by an SMRT staff that I had to exit and walk around the station to get into the NEL entrance. I finally boarded the NEL and arrived at my meeting almost half an hour late. I consider myself fortunate that I was able to hop onto the NEL. The guy sitting next to me on the East-West Line train (before it stopped at Outram) said that he was heading to his home in Simei. I think he, like hundreds of thousands of other commuters, probably got home much later than usual. This 3.5 hour service disruption, which happened simultaneously on the two busiest MRT lines during the Tuesday evening rush hour, was probably the most serious service disruption ever. I had flashbacks to November 2011, when I had another close shave — I just missed getting on one of the trains from City Hall station that was to eventually stall in the middle of the tunnel. 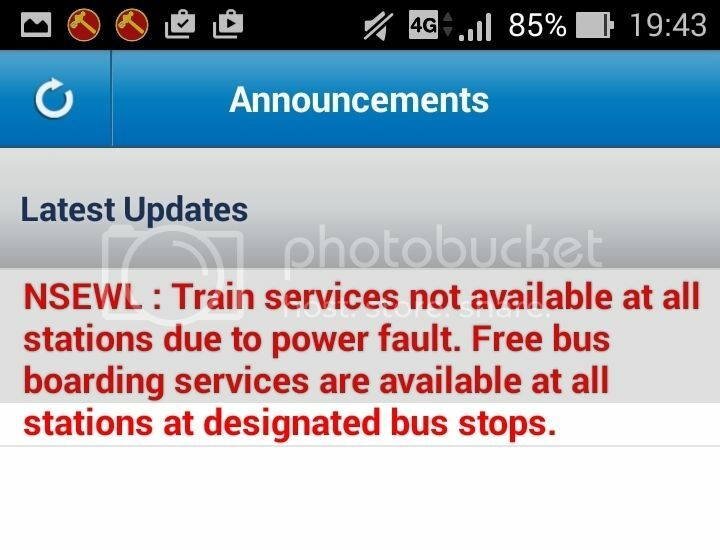 According to SMRT and LTA, the outage was due to a power fault. Preliminary investigations found that a faulty train could have caused the power to trip. I find it astonishing that a fault with a single train could cause power to be cut to trains at all 58 stations on the NSEWL. Is there so little redundancy in the system? Or are all the circuits strung together in series like a cheap set of Christmas tree lights? As of the time of this writing, it is still unclear if the MRT service will be available in time for the Wednesday morning rush hour. SMRT has already advised commuters to make alternative travel plans. Both the Minister for Transport and LTA have come out to apologise for the breakdown and demanded that the faults be investigated and rectified. That is little comfort for the quarter-of-a-million or so commuters who suffered this massive inconvenience and frustration. It was reported that all commercial drone operators will need to apply for a permit. Can the Minister explain why is this requirement being imposed on all commercial operators? Is the risk posed by commercial operators higher than that of, say, hobbyists? Would it not be fairer to require permits only for drones above a certain weight or size, rather than placing a permit requirement on all commercial operators? Unmanned aircraft, also known as an unmanned aerial vehicles (UAV), remotely piloted aircraft (RPA) or “drones”, are aircraft which can be operated without a human pilot on board. This Bill introduces a new regulatory framework to address security and safety concerns posed by unmanned aircraft flying in Singapore’s airspace. Until recently, drones were better known for their ability to spy on enemy movements in the battlefield or deliver precision strikes on terrorists in troubled regions. However, in the past few years, drones have been more commonly mentioned for their commercial and civilian, rather than military, uses. There is the “Octocopter”, which online retailer Amazon is planning to use to deliver packages in as little as half an hour after the purchase. Drones are also being used for aerial photography, patrolling of secure areas, inspecting ships and oil spills, and search and rescue operations, to name just a few. In introducing this new regulatory framework, the Government should take care to avoid hindering commercial developments by placing too heavy a regulatory burden on the drone market. This is so that our companies and our local entrepreneurs can benefit from, and contribute to, some of the promising innovations in this exciting new space. The Bill empowers the Civil Aviation Authority of Singapore (CAAS), with the approval of the Minister for Transport, to make orders and regulations with regard to unmanned aircraft. The detailed regulations have not been spelled out in this Bill, although some have been mentioned in media reports (and in the Minister’s speech). First, will the regulations specify that drones must keep a safety distance from persons, vehicles, buildings or structures, as well as from congested areas or large groups of people, such as sporting events or concerts? Second, on requiring “geo-fencing”. Flying drones within 5 kilometres of an aerodrome is already prohibited under the Air Navigation Order. However, there is a risk that drone operators may unintentionally fly too close to an aerodrome or military installation. This will pose not just a security risk, but also a safety threat to aircraft taking off and landing. As such, has the CAAS considered requiring drones above a certain weight or size to be equipped with geo-fencing capabilities? Using geo-fencing, the drone can be programmed with the co-ordinates of aerodromes and security-sensitive areas in Singapore. If it tries to enter these areas, it will be forced to turn around or land. I understand that many commercial drones already come equipped with geo-fencing capabilities, so it should not pose too much of a regulatory burden for these drone operators. Third, CAAS regulations currently prohibit a drone from being flown beyond the normal unaided “line of sight” of the person operating it. However, there are currently beyond-visual-line-of-sight (BVLOS) technologies being developed, which enable a drone operator to make course changes to avoid obstacles, including other aircraft, using on-board cameras. It was recently reported that the US Federal Aviation Administration is working with private companies to test commercial drones that can fly beyond an operator’s line of sight. 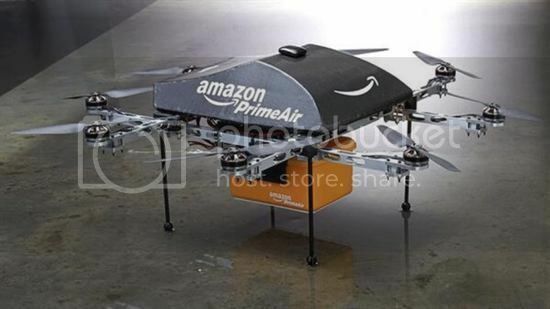 This will open up the possibility for more sophisticated drone operations such as package delivery. While it is still early days for this technology, I hope that CAAS remains open to issuing permits, on a case-by-case basis, to companies to test-bed such technologies in Singapore so that we maintain an edge over our overseas competitors. Fourth, it was reported that all commercial drone operators will need to apply for a permit. Can the Minister explain why is this requirement being imposed on all commercial operators? Is the risk posed by commercial operators higher than that of, say, hobbyists? Would it not be fairer to require permits only for drones above a certain weight or size, rather than placing a permit requirement on all commercial operators? Fifth, if commercial operators are required to apply for a permit, then it is important that the assessment criteria for permit approvals be made transparent, in terms of the specifications of the drones, the types of commercial uses that will be allowed and whether there would be any requirements for operators in terms of training and qualifications. If this law is to be effected on 1 June 2015, which is just over two weeks from now, then sufficient time must be given to operators obtain the permits without interrupting operations. And sixth, CAAS has said it will serve as a one-stop centre for all drone permit applications. This is a welcome move. I hope this will help reduce red tape and the time taken for permit approvals. Can the Minister share what the typical waiting time for a permit approvals is expected to be, so that commercial operators can better plan their schedules and operations? I have some security concerns about the risk of drones being used for terrorist activities. While this Bill will probably be effective in preventing law-abiding drone operators from unintentionally causing harm to persons and property, it is unlikely to stop a determined terrorist from using a drone to fly explosives, or chemical or biological agents into key installations or large crowds, causing mayhem, fatalities and serious injuries. It is important that our security agencies develop plans for detecting, intercepting and taking down rogue drones. These include acquiring systems to “detect and defeat” drones. I note that Clauses 13 and 17 give the authorities the power to direct a drone operator to change course or assume control of the drone, by force if necessary, to end the flight of the drone in the fastest and safest practicable way. However, detecting and defeating rogue drones is not a straightforward task. Most drones are small, move slowly and fly low, which makes it difficult for radar to detect them. To “defeat” a detected drone by shooting it down or jamming its control signals could risk injuring innocent bystanders when it plunges to the ground, particularly if it contains a hazardous payload. According to The Economist, there are currently systems that can hijack a drone’s navigation and control systems, and fly it to a desired location, or to use another drone to catch the rogue drone in a net. In addition, there are technologies available to track the control signals of a rogue drone back to its human operator, and intercept the operator. Has the Government already acquired such systems to deal with rogue drones? Also, will there be any enhanced penalties for anyone convicted of using a drone to carry out a serious crime, as is being proposed in the state of Washington in the US? Finally, this Bill does not appear to address data protection or privacy issues with regards to the use of drones. My concern is mainly with the possibility of drones being used to take photographs of people or private property in a manner that infringes individuals’ privacy. Do current laws already provide for data protection and privacy from drones? I hope the Minister can explain how these laws are adequate and what the penalties are for violators. Third-party taxi booking services could encourage greater competition, innovation and service quality, and improve customer satisfaction. In regulating third-party taxi booking service providers, the Government should focus more on maximising benefits to consumers and taxi drivers, and less on protecting a particular business model or existing taxi operators. This Bill introduces a framework to regulate third-party taxi booking service providers, which include taxi booking mobile applications. In recent years, the near-ubiquity of smart phones in Singapore has facilitated the entry of several taxi booking mobile apps like Uber, GrabTaxi and Easy Taxi. Most of these apps allow passengers to book rides with any taxi driver, even independent limousine drivers, unlike the booking services run by taxi operators which are limited to a smaller pool of drivers. This can provide better matching of passenger demand with taxi supply. Some of these apps allow passengers to track the cab driver’s location, contact the driver directly, rate their drivers and even share a cab with others who are travelling the same route. They help reduce transaction costs, while encouraging taxi drivers to maintain high levels of service. They are a win-win for both passengers and taxi drivers. Passengers enjoy greater convenience booking cabs, and drivers have easier access to a wider pool of passengers. I understand some enterprising Singaporeans have started their own limousine companies and receive their bookings through these apps. A larger supply of drivers could help address the perennial problem of not enough taxis being available during peak hours or when there is a heavy downpour. With these “disruptive” technologies, the dominant taxi operators have to up their game or risk losing drivers to rivals. Their drivers could decide to switch to other operators who charge cheaper taxi rentals, while still receiving enough bookings via mobile apps. This could put downward pressure on rentals charged by taxi operators, which will benefit cab drivers. I would like to seek clarification from the Minister on Clause 10(b), in which the regulator, in deciding whether to register an applicant, “must have regard” to the demand for third-party taxi booking services in Singapore. Does this mean that if supply of these booking services exceeds demand, as assessed by LTA (Land Transport Authority), the regulator may decide not issue a taxi booking service licence? Can the Minister explain why the LTA needs to base its licensing decision on demand for third-party taxi booking services? Is it not the responsibility of potential entrants to assess the viability of their own business models? If the service being provided by the new entrant is more attractive, this will give consumers more choice and consumers will naturally gravitate to them, with weaker players fading out. I don’t think the Government needs to make this decision for consumers. Overall, I am glad to see that this Bill does not go the way of several other cities that have implemented outright bans on drivers accepting bookings via certain ridesharing apps. It is not a free-for-all, where any private car driver can accept bookings via these apps. At the same time, the regulations require basic consumer protections to be in place, like requiring drivers to be properly insured, conducting background and health checks on drivers and prohibiting overcharging of passengers.